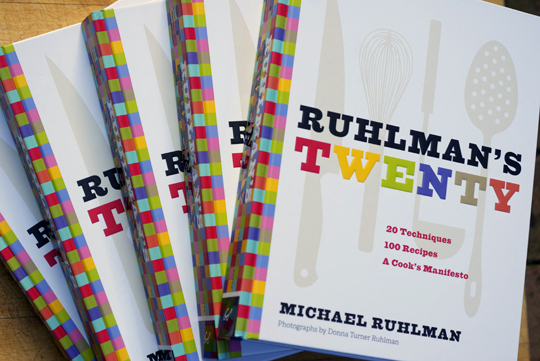 There has been a flurry of activity in regards to Michael’s new book Ruhlman’s Twenty it is featured in today’s Chicago Tribune; “20 Steps to Better Cooking”. Joe Crea from Cleveland’s The Plain Dealer writes about a few of the Twenty techniques, in “Michael Ruhlman’s ‘Twenty’ Recipes. Russ Parson’s of the LA Times has also reviewed Twenty. Tonight at 6:00pm see Michael at Lantern in Chapel Hill, North Carolina. Thursday Michael is back in Ohio for the Cleveland Culinary Challenge that is being held at the Tri-C Hospitality Management Center. On November 11 & 12 see Michael at the Fabulous Food Show in Cleveland. To learn more about events follow Michael on Facebook and Twitter. Ah, man, I would have gone to Chapel Hill if I knew in advance. Only a couple hour drive. Russ Parson’s article is very nice indeed. My assistant, a twenty-three year old named Leighann, who graduated from Colgate a year and a half ago, has been learning to cook since she came to work here. Our biggest accomplishment together was successfully making Peter Reinhart’s bagels as adapted by Luisa, The Wednesday Chef, which inspired her to want to move on to bigger and better things. So I said starting in January (after she gets done studying for her graduate school entry exams), we will cook together once a week. She came to my apartment, and I gave her a choice of our using The Art of Eating Cookbook or Twenty. She picked Twenty. When are you coming to NY? good choice! i’ll be in new york briefly next week but not sure about actual schedule. just doing the martha show as far as i know. Please announce on the site when you’ll be in NYC! I want to know how Mr. Parson’s Date Night Chicken ended…with a bang and a boom? An intense but fun read. Happy book tour. Fun to hear how it is going.